I have been wanting to try this eye liner for forever –ever. I love gel pot eye liners, they are great for making precise cat eye liners or smudging the liner really close to the lash line. 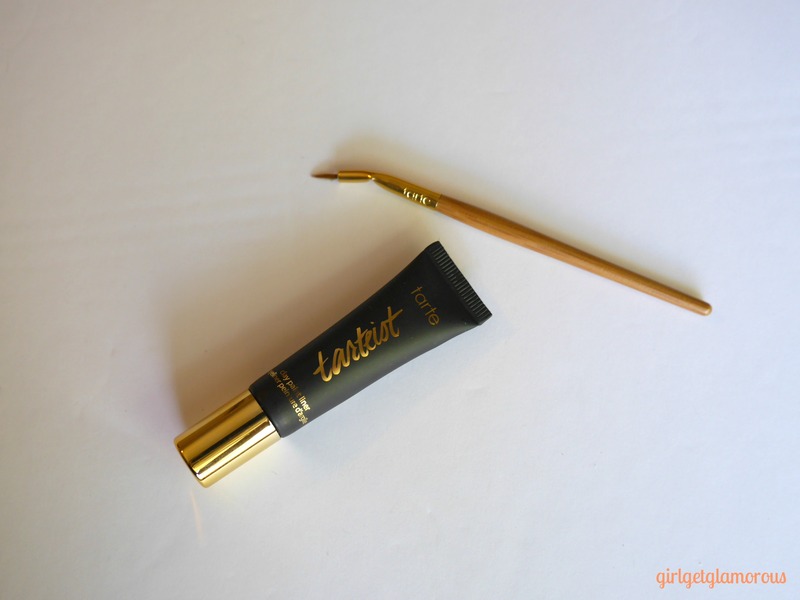 What makes the Tarte Cosmetics Tarteist Clay Paint liner so different from most gel eye liners is the container and packaging! The liner comes in a tube with a scooped out top, so you can put a little bit of the liner in the top and wipe your brush off on it to get just the right amount of liner on the tip. I am going to also try it with a thin angled brush to see if I can get my lines any tinier. I like to do a cat eye look with the thinnest liner brush I can find. I even cut a few of the bristles off of this brush to make it smaller. I like that you can add just a tiny bit of liner to the top part. It makes me feel like the product is going to last much longer than a traditional gel liner in a pot before drying out. It also allows me to squeeze out just the smallest amount of product, which is so necessary when working with gel liners. They tend to take a while to dry on the skin, so less is more when applying. I always need to wipe a ton off my brush before I start my cat eye. As mentioned, the brush is great, but for a cat eye look, it could have even a thinner tip. I cut a few of the bristles off to make the tip even thinner. If you were wanting to use this liner across your eye, just close to the lash line, the brush would be the perfect size. Here is another area where this product stands out from the rest. The formula is ultra lightweight, but still full coverage. It glides like I have never seen before. If you’ve ever thought you couldn’t do eye liner right, you need to try this. It smoothed out so easily across my lid and made the perfect cat eye. I’ve never had a gel liner apply so easily. It spread like warm butter. Okay, I put this bad boy to the test on day #1. I went for a hike with my friend and it was 102 degrees by her house. We hiked for an hour straight in the sun and that heat. On purpose, I only sprayed half of my face, including one eye, with setting spray before. I wanted to see how the liner would hold up on it’s own and with an other worldly magic potion over it, a.k.a. setting spray. To my surprise, both sides held up amazing in that heat! The side with the setting spray did hold up better, but the side without only got slightly blurry looking after hiking an hour in those high temperatures. This liner comes in only one shade: black. But dang do they do it right. It’s a very rich black shade, that dries to a complete matte finish. I like that this product is Vegan and doesn’t contain parabens, mineral oil, or sulfates. Tarte uses a lot of all natural ingredients, which I love. Especially on an eye product. This will be a product I will be reaching for again and again. I’ll be playing with it a ton and trying different brushes and looks, but overall it gets an A+ from me. The brush tip could be a smudge smaller but that’s about the only thing I’d change. You can get it on sale for $12 here, (today 3/18 only)and also Sephora and Tarte. I’m wearing it in these photos with the new Tarteist mascara. Let me know if you want a review on that mascara too! Thank you for reading! I hope you find these reviews helpful. I want to post a tutorial on how to do a cat eyeliner look next, let me know if you want to see that in the comments below! Individual Lashes: Easy Said, Easy Done.